Whereas my girls' interests might vary and change over time, one thing that they have both always stayed passionate about is helping the earth. Whether it is the constant reminders to recycle every piece of paper, the disapproving looks as they hurry over to turn off an unneeded light, or the repeating questions as to why someone would even consider littering, I love knowing that they are growing up with care and concern about our planet. Recently, we were introduced to yet another way to help make a difference... and it even involves delicious foods — a win-win! I'm not sure who was the most excited to join in the the Entenmann's Little Bites "Recycle… Reuse… Replenish" Fully Recyclable Lunch Campaign! Entenmann's Bakery, the name that has been making life a little sweeter for more than 100 years with their amazing fresh-baked goods, has partnered with TerraCycle, an international leader in the collection and reuse of non-recyclable post-consumer waste. Together, this dynamic team has launched the first-ever "Recycle…Reuse…Replenish" Fully Recyclable Lunch campaign that is helping kids become recycling pros and turn trash into cash for their schools! The process couldn't be much easier (or more tasty). 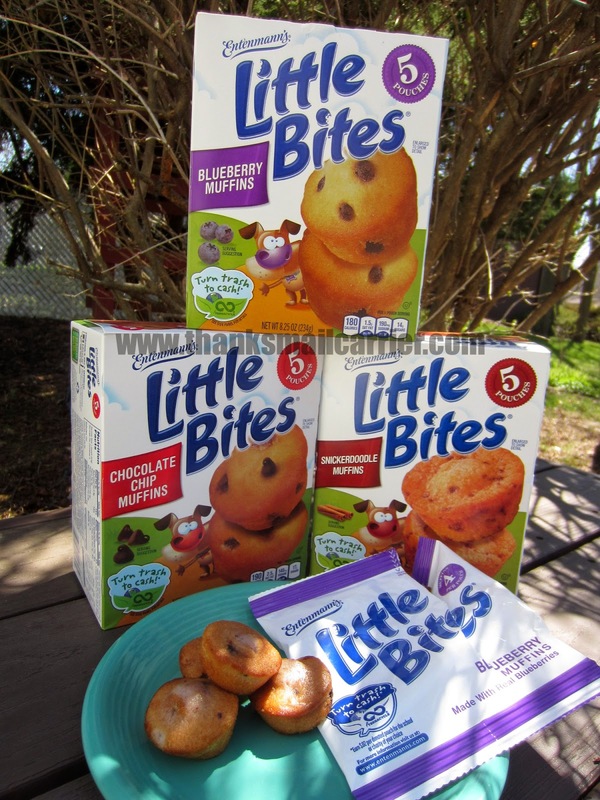 After kids snack on their favorite Entenmann's Little Bites muffins and brownies, they send the empty pouches to TerraCycle to be turned into new products through the Entenmann's Little Bites Pouch Brigade. What a great way to teach kids the importance of reducing waste while earning money for their schools — I love that this unique partnership with TerraCycle demonstrates Entenmann's dedication to recycling and reducing the amount of Entenmann's Little Bites pouches that end up in landfills each year! 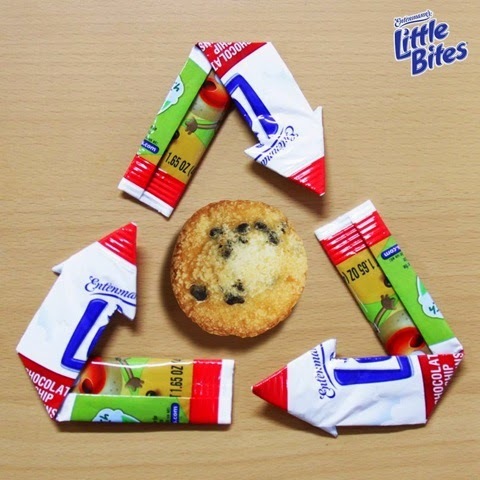 As the recycling and upcycling experts at TerraCycle are committed to creating new lives for Entenmann's Little Bites pouches, it is great knowing that the used packaging is turned into innovative new products, while also awarding points for schools that can be redeemed as cash for every Little Bites pouch received. Check-it: look for numbers and recycling symbols on plastics to know what types get reused. Be sure to recycle your Little Bites pouches with the TerraCycle Brigade programs. Sign up your school if it is not already participating and check out what other lunch items TerraCycle recycles! Put your sandwich in reusable lunchbox container to take home and use again. Before you toss anything away, stop to think about how you might be able to use it again. TerraCycle's team of designers make products out of wrappers and packaging and you can find DIY project ideas to try as well! Have any leftovers from lunch? Before you throw away, make sure to check out what biodegradable foods can be brought back home to be added to a compost pile. Make compost at home! Be sure to include the three basic ingredients: Browns (dead leaves, branches, twigs, cardboard, newspaper), Greens (grass clippings, vegetable waste, fruit scraps, coffee grounds) and Water to make an effective outdoor composting area. More helpful info on composting at home can be found from the Environmental Protection Agency (EPA). Big Sister E and Little Sister B were more than excited to enjoy the large variety of delicious Little Bites products while also knowing that their pouches would be recycled into things like garbage cans, park benches and even bike racks. Talk about a sweet idea! Want to join in helping eliminate waste while also earning money for your school or favorite charity? Head over to the Entenmann's Little Bites Pouch Brigade today to find collection locations, see how much money has been raised, sign up and more! You can also find out more about the full collection of decadent, drool-worthy Entenmann's selections by visiting Entenmanns.com and connecting with them on Facebook, Twitter and Instagram. Entenmann's Earth Month Prize Pack* (ARV $60)! 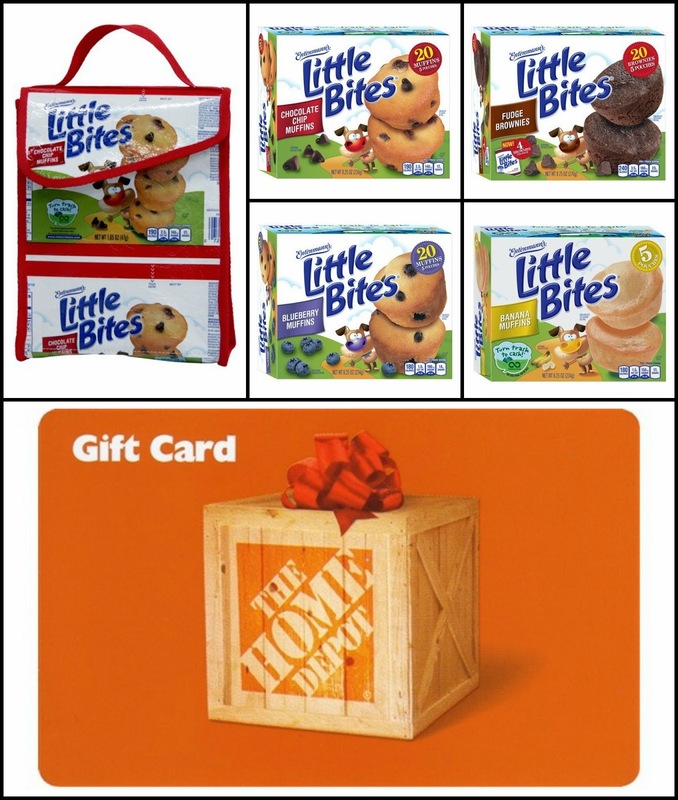 *Prize pack includes (1) $25 Home Depot gift card, (4) $5 Entenmann's Little Bites coupons and (1) Little Bites upcycled Lunch Sack made by TerraCycle. A big thank you to Entenmann's for providing the coupons, gift card and upcycled lunch sack for me as well as for one lucky giveaway winner, however, this giveaway is being brought to you by Thanks, Mail Carrier, not Entenmann's. The opinions shared are my own and honest and if you really need to see more, click here to see how I roll. Thank you for the giveaway. This is a cute lunch bag! I love it! I always try to reduce and recycle, but would like to start reusing items too. It is a great idea! A lot of waste can be reduced and many recycled into other products! I think the 'Recycle...Reuse...Replenish' Fully Recyclable Lunch Campaign is definitely a worthwhile cause! I think it is fantastic. It's good to start kids out young learning about how they can help reduce waste. Glad that big business is working toward a clean environment! I think its a wonderful campaign that encourages other to do some good! I think its a great idea and definitely something my children would enjoy being involved in. I think it is a very good idea to promote recycling and reusing items! We need to take care of our Earth! I think the Campaign is a great thing! I think it's a wonderful campaign!! I think the idea is great! It's a great way to teach kids about taking care of our environment. Anything that gets kids involved in recycling sounds good to me. I think it's a wonderful campaign and a great way to teach kids about reducing waste! I love this campaign, great to give kids chances to respect and save our Earth. I love it! We do as much as we can, as a family, to reduce-reuse-recycle.. so I think its great to see companies (especially ones my kids love - they always take the mini muffins in their lunch) having a part in something that is so important. It's a good idea...we all need reminders as we can all do better! I think it's a workable idea and I'm glad to see they're offering it thorugh multiple blogs or sweeps areas. I think it is a great campaign and sending a great message to young kids. I think it's a wonderful thing they are doing. I love this program. I actually tried to get the school at which my mother works to participate (I don't have elementary school aged children) but they weren't interested (boo hiss). My daughter's preschool also did not participate, and at that point I just gave up. We go through TONS of these pouches and I hate throwing them away when I know they can be recycled! I'm excited to check out the link for finding locations where they can be recycled. It's a wonderful campaign. great for bringing more awareness. I think that this campaign is a wonderful way to bring awareness to recycling. I love that a donation is being made to a good group for recycling. I think it is a great idea and a good thing for kids to be learning and practicing. The lunch bag is cute and I love that it encourages kids to reuse and recycle. I think it's great! sometimes we take for granted things we have and just toss them out instead of reusing or recycling. It's great that it's educating people! I think it's a great idea! wish more companies had campaigns like this one! I think it's wonderful! I only hope that schools are being supportive & encouraging it now, too! I like the idea of teaching kids. Every little bit helps! Absolutely agree with this program...I try to reuse everything I can, recycle the rest if possible. We grow most of our own food. Guess that's our replenishing part. I love the idea of it. Love the idea of recycling for schools! Teach your children well... Good idea. I think it's a great idea. I always try to recycle and reuse what I can. If everyone did this every day, we would see a whole lot less wasted. The schools should try to implement a group or club just for this purpose and to help kids to learn how to reuse and recycle what they can. I think that this campaign is a great way to remind kids about recycling. The campaign is a great idea. It's good to get kids thinking about recycling early so it becomes a habit. Wonderful campaign! Never too early to teach children how important this is! I love seeing corporations doing good for the environment! It makes me happy to see entenmanns putting this kind of effort it. What an awesome way to get the little ones involved! It only makes sense. There is to much waste. I think it's a great idea to get kids involved. I homeschooled, and was always looking for ways to teach my children ways to help the environment. This is a great idea to encourage children to reuse and recycle. It is THE BEST idea! IF ONLY we could get everyone to recycle. I know people who do not. And they do it because it does take a bit of work! Some people are way too lazy and do not actually see the big picture. It's a great campaign! I always like to see businesses take responsibility for the way they do business in regard to their footprint on this planet. It's a wonderful idea, we all need to recycle! I think this campaign is a good way to raise awareness about how much garbage goes into the dumps from disposable wrappers. It's nice to see larger brands producing food in a more sustainable way. I had no idea they were doing this and gained more respect for the company. I love it! I think it is a good way to help teach kids how to recycle. Of course I love the campaign. Yummy food and working toward bettering the environment with packaging. Win win. I love the idea of reusable. I do anything I can to help the environment. I think it's a wonderful campaign and am so glad that companies are actually starting to care about GMO's, the planet, etc. It has to be a worldwide project to protect people and the planet. It also teaches children about recycling. Great idea. I think it's a great way to get people thinking a little more about the wastes they are producing and also about ways to recycle. Love the tip about re-using lunch containers instead of plastic bags. It's such an easy thing to do! It is a great campaign. Makes a lot of sense. I love the recycling part: we need to teach our children by example. I think its a wonderful campaign. Love the campaign. Love little bites and what a great way to teach our children about recycle and replenish! Need to teach children the importance of recycling and giving them a good treat will help reinforce that message. I think Entenmann's campaign is great! Sometimes a reminder like this fun campaign is just what I need to keep up my resolve to do my part. I was raised by my grandparents in the 70's, who had come of age in the depression. Avoiding waste was a big thing with them and my brother & I absorbed it well. A campaign like this really resonates with me. A great way to reduce and reuse. I think it is a fun and good way to teach children to reuse. help teach children about recycle and reduce and reuse. Honestly...I think it's great that the package can be recycled, but I'd rather recycle at home and I'll teach my student about it myself. Let's do other more important things at school and get the corporations out of the classroom. I'm happy to make a monetary donation to our schools. I think this a great idea. Any thing that can be reused helps the whole world. The campaign also teaches kids about recycling and helps schools. What could be better? I think when big companies encourage recycling it has a big impact on peoples thinking.So,I think they are great to do this. I love their campaign as well as my kids! Any campaign to help restore our planet is GREAT!! thanks!! I love this campaign! It really teaches kids (and adults) the importance of recycling and saving what we have left of our planet. Thanks so much for hosting this giveaway! I think it's great that bigger companies are getting on board and making efforts to go green!!! Every little bit from everyone adds up! Yes it is great by going green and I like the ideal that it is recyclable. It is very important to me to recycle and reuse so to see this blog post makes me think about it in a new way. This is a great campaign. We have a compost barrel that is well used. I love this idea of these big companies taking responsibility for the packaging of their products! We love mini bites in our home and eat them all the time, so its great to know that they understand! Going green and recycling is a great idea. Keep it up. I have a special composting station in my backyard. I garden and use the composted material as natural fertilizer. This recycling program is great. Love to see things used again instead of going into a landfill. I think it is a great idea, we need to keep our planet clean. I think the 'Recycle...Reuse...Replenish' campaign is an awesome idea. Anything that can help our planet and convert people into recyclers is great! I think its catchy and a great message. I like the idea! Cute lunch bag, too! I think that keeping the planet clean is a great idea! I like it and the fact that it is teaching our children to keep the planet clean! I really like the concept of the Campaign. The bags are cute also. I fully support the "Recycle…Reuse…Replenish" campaign...anything we can do to save the earth is a good idea! Very nice; hope to win. My son IS a mail carrier! I love them! I have tried them and they are the perfect size too! The blueberry are great! They are perfect for snacks at anytime of the day too! We are big on recycling as much as we can. I think this a great program! It sounds like a good idea and a good influence on kids. Sounds like a great campaign...one step further would be to stop using plastic for their packages!! I think that this is a cool idea. I love how companies like this promote recycling! I think its a great campaign and a wonderful thing to promote! I think the Campaign is a great. Keep recycling. Entenmanns Little Bites make a great gran-and-go snack. I really like that they have a plan to make recycling easier and fun! I think the 'Recycle...Reuse...Replenish' Fully Recyclable Lunch Campaign is great for teaching people to utilize the resources to help our planet. I think we need to be involved in reducing waste in whatever ways possible and this campaign is great for teaching people the different methods. I think it's a great idea. I wish the whole world would participate. great campaign, wish it lots of success! I like any campaign that supports recycle and reuse! I think it's a very good campaign. I think it's a good idea. Even if you already do it, it never hurts to get a reminder. I think it's a pretty great campaign! I like that the goodies are in appropriately sized packages and I like that they have the schools involved like Campbell's. I think itll work out great! I really like it; it's definitely a way to get people thinking differently! I like the program, a little unsure of the saving things from lunch at school, but we compost what we don't eat at home. I think it this is an awesome campaign to get families involved. It's awesome to educate the children. When I was growing up nobody ever talked about recycling or for that matter any conservation. Bravo! I think that it's a great idea to focus on recycling. The campaign was a good idea. Their campaign caught the attention of my 7yo son last month, so its working! This is such a great idea. I love it! This looks like a great way to encourage recycling! I love the idea of recycling packaging like Entenmann's is encouraging. It's a forgotten piece of the waste and recycling stream. I try to follow this in my life so I think it is wonderful. Its great that the company is encouraging recycling; this is something we do at home already! I appreciate companies that care about the environment! Everything helps! I thin it's an awesome campaign and I will be even more likely to buy the Little Bites because of it. I love it and I think it is great that they use something that would be thrown away to make something new! I think the 'Recycle...Reuse...Replenish' Fully Recyclable Lunch Campaign is Awesome! I think that it's an awesome idea. It's a great reminder for me to try to do my part consistently. I think it's brilliant. Getting kids to think about trash/recycling/reusing early is the way to change habits. I think its good that they are teaching kids to recycle. We need to teach our children/grandchildren at a very early age. We need to leave them a clean world to live in. The campaign is really great. Good for kids. A good way to get kids to start recycling. I "RE"-ally love their campaign. It's "RE-freshing! It is a good idea and a great way to remind all of us to recycle. What better way to get kids as well as adults thinking about taking care of our planet, than bringing in the donuts to teach us! It's a good idea and helpful for those that are not sure about how to recycle. I think it is great that companies are doing more to promote going green. Great campaign. We recycle, reuse and repurpose in our house. We also are always looking for ways to save on water and electricity. I like the taste of course and the convince. I think it is great. My kids love their reusable snack bags and anything that encourages the 3 Rs is a good thing! I think its great! Wish more companies did this. I think it is a responsible campaign from a delicious company. Love the idea, a good cause to really help cut down on waste in our landfills. I love the campaign. It's great when a company takes the initiative to help change the world for the better. It's a great cause. I think it is a great idea! Teaches children and adults alike to not waste! I love it! I'm a big on recycling. I think you should recycle whenever you possibly can. I think it's great! It's a great concept to teach to kids! Its a great campaign, we have to take care of our planet! I think it's a great a program, I never realized how much paper and plastic we went through until we started recycling. It's a good campaign... now if they would remove gmo's from their products... that you be even better. It's great to see a company act responsibly and take care of the waste it created.